With a population of 7.3 million, about 347 vehicles for every kilometre of road and construction sites at every street, Hong Kong ranks among the noisiest cities in the world. This fact stands behind the theme “Noise Shooting” for the 12th exhibition by the Hong Kong Professional Photographers Network. This poster was created to not only look “noisy”, it takes this idea even one step further. Realised in continuous shots, it shows the face of a stressed-out man yelling out in frustration. The individual shots were then arranged to form the number “12”. The noisy, unharmonious and even disconcerting feel was then further enhanced by using freehand calligraphy that looks untidy and purposefully jittery in the true sense of the word. Using a UV flatbed printer, the design was then printed on bubble wrap, familiar to many as simple packaging material, encouraging viewers of the poster to pop the bubbles on the wrap and thus contribute to the overall surrounding noise of the city. The concept and realisation of this poster is the result of an outstanding approach. 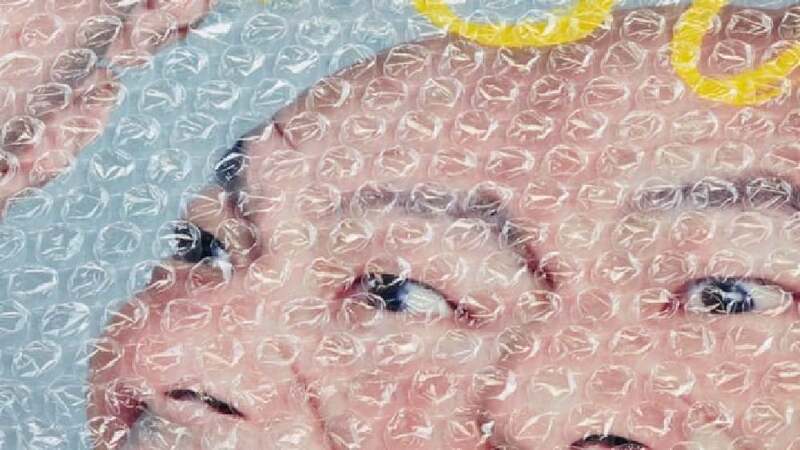 The idea to print it on bubble wrap is remarkable and original, as it makes the work truly interactive and directly confronts viewers with the topic of noise. In addition, the visual idea also convinces with continuous photographic shots that augment the sense of the yelling depicted.